"Optimism may help you live longer and better in numerous ways". 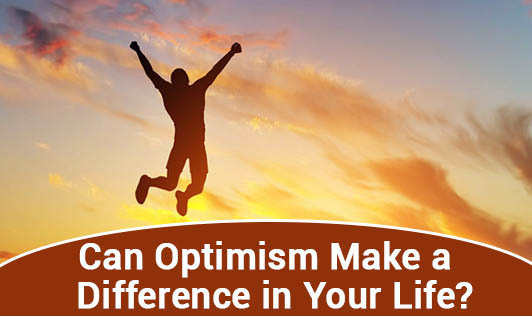 Research has shown that optimists are less likely to develop depression and die from heart disease than pessimists. The reason, partly being that optimists are better at coping with hardships and obstacles. When faced with a difficulty, optimists have a tendency to respond with active problem solving skills, a sense of humor, and positive thinking. Pessimists, on the other hand, tend to respond with denial, hopelessness, and evasion. How does Optimism improve your life? • Optimism helps you realize that you have more choices than you think. It will enable you to think of and act on good, healthy choices. • Optimism will help you seek an environment that is remedial and uplifting. When you're optimistic, you will do things such as believing that you can make changes in your space like getting organized and keeping it that way. • Being optimistic, will help you believe that you have what it takes to be physically and mentally active on a daily basis. Your positive outlook towards things will help you get back on track when faced with setbacks or road blocks. • When you're optimistic, you rest easier because you have a positive view of your future which will allow you to relax, de-stress, and sleep well at night. • When you're optimistic, you will have a positive and cheery outlook which will improve your interpersonal relationships. • Lastly, optimism will help you think positively about your nutrition choices, because it will help you understand that you have the power to control and influence your health by choosing the best possible food for your body. Wherever you stand on in the optimism/pessimism spectrum, remember that a pessimist can develop good habits at any time too. Healthy optimism should be accompanied by healthy skepticism! !